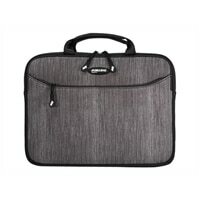 Mobile Edge SlipSuit - Laptop sleeve - 13.3-inch - carbon with black accentsHere's the simple way for students, business people, and everyone else to protect their laptop and its power supply. The durable neoprene will help keep your laptop protected while on the go. Reinforced corners and heavy-duty zippers help ensure your laptop's protection no matter where the road takes you. Here's the simple way for students, business people, and everyone else to protect their laptop and its power supply. The durable neoprene will help keep your laptop protected while on the go. Reinforced corners and heavy-duty zippers help ensure your laptop's protection no matter where the road takes you.